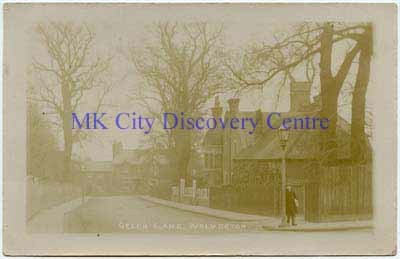 Postcard of a photograph of Green Lane, Wolverton, looking north east. Image is badly faded but shows a boy stood at a lamp post in front of the building at the junction with Moon Lane. Postcard was sent to Miss Nellie Sear in Hampshire from her sister Maggie, 6 May 1911.